Whip up a fresh hot batch of pre-event publicity and serve it with a side of fresh sponsorship before your main course. 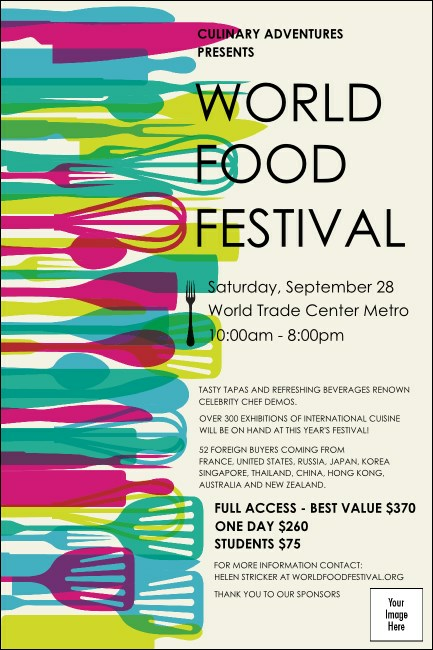 The World Food Festival Poster details some of the tools of the trade and garnishes your upcoming celebration of international cuisine with a little bit of extra color. Measures approximate 11.46" x 17.18"
TicketPrinting.com can help you hone your publicity.